The Cubco was the creation of Mitch Cubberley, a mechanical engineer from New Jersey. He started working on ski bindings in the early 1950’s and used his engineering know-how to address many binding-related issues. His binding was a step-in; the toe could release in all directions including up; and the heel could release in a forward fall. He also designed the first ski brake. Actually Cubberley and Earl Miller both can claim firsts in terms of step-ins, multi-angle release, and ski brakes. They apparently were unfriendly rivals who developed different solutions and held different opinions of the other’s work. But that’s a story for another time. Back to the Cubco binding. With so much going for it why did many of us look down on Cubco owners? Well, the most common complaint from experts was that Cubcos had a tendency to pre-release. Ed Pearson echoed this in his response, but still felt the binding was a good choice for kids. I know I observed intermediate skiers in the moguls where they were a little off balance, but not falling, and “thwangzzzz” – now they were falling! Then there were the metal plates you screwed to your boot toes and heels. These snapped into the binding providing metal-on-metal contact that gave a more consistent release than metal-on-leather. However this made rather clumsy tap shoes out of your boots as you click, click, clicked your way through the base lodge. Then there was that noise the Cubcos made when they released. When you’re falling the last thing you want is something to draw attention to that fact, but there it was. The springs in the binding were exposed so there was nothing to muffle the sound when they recoiled. Cubberley’s ski brake was a further example of this. Unlike today’s dual pronged brakes, the Cubco brake had a single blade-like prong significantly longer than today’s. This was because the brake was designed to flip the ski on its side when released. Because of its knife-like appearance the brake became known as the “toad-stabber”! While it was (and is) easy to poke fun at Cubco bindings, we owe Cubberley and his contemporaries a debt of gratitude. Their work improving release bindings reduced ski injury rates by 75%! And after a binding released, the use of ski brakes meant you wouldn’t be flogged to death by your own skis. Step-ins meant no more bending over to put your skis on. We take these all for granted today, but they all can be traced back to Mitch Cubberley. i just happened upon this site and was sooo happy to see that a nephew of mitch’s had written. i OFTEN think of mitch and going to his place in the catskill’s with the peacock’s running all over….my mom, janet beland, knew mitch for many years and was a very dear friend. i wasn’t a skier when i knew mitch but am an avid skier now and thank him for inventing the cubco binding! thanks jeff for putting a smile on my face today! I was just thinking about my skiing roots here in the northeast (and the fact that what remains of family ski centers have no snow this year), and Cubco popped into my head. My younger brother had them. They did pre release, but that’s probably why that daredevil was able to continue to be an athlete and go on to be a professional ballet dancer. My dad, who raced for Vermont, amazingly only broke a thumb while racing. He skied in double lace leather boots, Marker bindings with rear straps on 210 boards until the mid 70s. I only saw him fall once and it was so graceful. Cancer took my dad at 55. Who knows what else these engineers would tinkered around with. I was so jealous of my friends who had Cubco bindings. Step in and go. 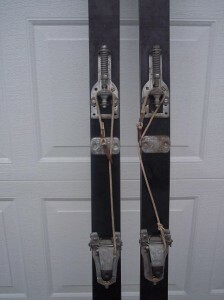 I had Northland wood skis with Cable bindings and the 10 foot leashes and Tyrolian tie boots. I think they got 2 runs in while I was getting ready. The one reward was extremely cold icy days. The boot plates offered zero traction and they would fall while walking. Also, the Cobcos were notorious for getting ice in the spring and becoming completely inoperable. In later years, Cubco offered Teflon coated versions. I started skiing in 1959 and the first bindings I had were Cubco. No one I knew ever had Cubco bindings and other skiers would say discouraging things about the bindings, but they were the only ones at the time that had both a heel and toe release. A lot of people didn’t like the hardware on the boots, but as a kid I didn’t mind the noise. In fact, I can remember one time getting up early on a Sunday and going to church, and of course wearing my ski clothes and boots so I don’t miss a minute of ski time, and walking up the and making a tapping noise all the way to my seat. Sure, you could call them ugly, but I loved my Cubco bindings and they lasted me all the way the late 60’s, just adjusting them as I grew. Wow, just stumbled on this! My grandmother’s sister, Blanche, was married to Francis Davenport, who owned Highmount. They were good friends with Mitch, and I used Cubcos as a kid. I also grew orchids and visited Mitch and saw his collection, overlooking the Papactin Reservoir. I still have a piece of a cymbidium he gave some 40 years ago. I was fortunate to have parents who put me on skis at age 7 in 1966. The place was Timber Hill (now Alpine Mountain) in Analomink, PA AKA the Poconos. I distinctly remember that our family was in the severe minority of skiers equipped with safety release bindings (CubCo of course! ), and Reiker buckle boots (amazing!). Nearly everyone else had lace up boots and cable bindings, some with rudimentary pre-Marker era swivel toes, but most with non-release toes or long thongs. I can stil hear the clickitey clack noises we all made walking through the lodge and, yes, slipping and falling a few times because the metal fixtures on the boots made for very poor cornering on slippery surfaces. But we were young and thus still made of rubber so jonone ever got hurt, and thanks to CubCo safety bindings we never got hurt on the slopes, either! Fond memories of Highmount, Uncle Mitch and his A-frame ski chalet ovelooking the reservoir. My Dad was his friend/attorney. Grew up sking at Highmount in the 1960s. Lots of great memories. Place was founded by my grandfather – Maurice Davenport, his brother – Francis, and a few friends. Ultimately Uncle Francis (then his son Philip) owned and ran it. Did a lot of ski racing there (Trailsweepers Ski Club). Mitch used to throw an annual ski party there for his employees and others. Stumbled on to this website/page when researching a NOS set of Cubco bindings I have (still in the unopened box). As a long time Highmount skier and patroller, Mitch and his associate Joe Powers were good friends. Just today (5/17/18) my brother Lynn showed me a board on which he had mounter two pair of Cubco bindings with the boxes they came in. He thinks he got them from Joe but they may also come from Mitch. The board when finished will become a wall hanging. As it would happen, my children and my wife started skiing on Cubcos, and I have a pair of Elite Adult bindings and a pair of Junior bindings. I am in the process of completing a board display of each, including the mounting directions, information card, and even the boxes that they came in with the discount prices Joe Powers marked on them. Hopefully, I will be able to post a picture on the Facebook Site shortly. I Googled Cubco recently, and I would highly recommend all to do so. It is a very interesting read, and has a lot of wonderful things to say about our friend and fellow Highmount skiers, Mitch & Joe.